If it sparkles, I like it and boy does this sparkle! This polish almost seemed... slimy, like someone had put some corn starch in the bottle. It didn't make application difficult but it was just an odd texture I haven't seen before. 2 coats. This is a cool color. 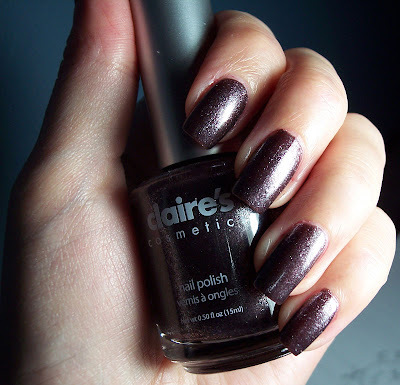 I never get lucky with the formula on Claire`s polish`s. Pretty shade! That's odd about the texture. I finally picked up a couple of Claire's last month but haven't tried them yet. I like that polish! Pretty color and nice and shimmery. Deez Nailz, lol about the rockstars! I like Claire's neon formulas so far and the rest, not so much. Hi Mary! Can't wait to see what shades you picked up. I love love love this color. It's so gorgeous! I live in Québec Canada and there is no Claires around here. 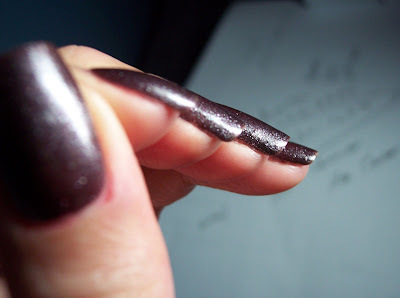 So can someone tell me if there is something that compare to that shade in OPI or Zoya.